Ingenuity can strike at a moment’s notice and creativity can show up in the most unexpected places. For Zac Brown, an average visit to get an oil change inspired what just might be the most unique dining and music experience in today’s festival scene. 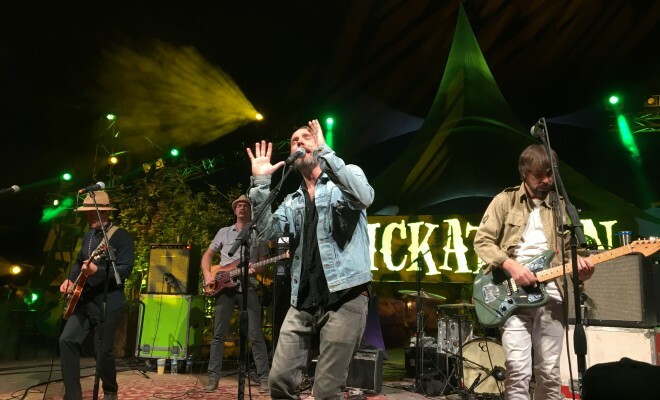 This new experience for guests became Southern Ground Music & Food Festival’s Stage Boxes. 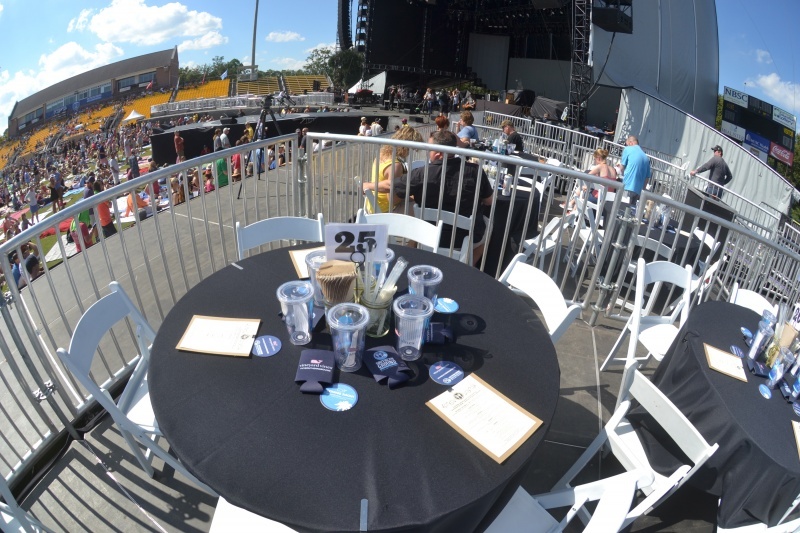 The perfect blend between chef-driven fine dining and the concert experience, attendees in these Stage Boxes enjoy gourmet meals designed and prepared by Chef Hamlin and other award-wining chefs all while practically sitting on the main stage. 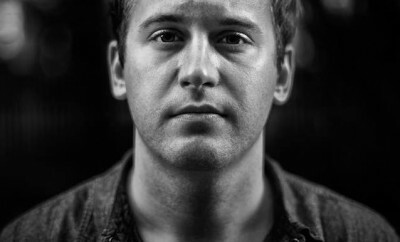 “Zach actually came up with the stage box idea,” shared Chef Hamlin. “One day he was like ‘Rusty, I was sitting and I was getting my oil changed. You know you pull up in this auto shop and it’s all clean and nice and beautiful, and all the guys you look at are clean, but there are some crazy things going on underneath you, where they’re changing your oil, they’re getting all messy and it’s probably like 40 or 50 people running around down there just trying to get your oil changed as quick as possible.’” Thus, the Stage Boxes were born. Set upon seven foot tall scaffolding, ten boxes, five jutting out from stage left and five on stage right, each holds four tables of six guests who will experience an incredible three-course meal each night of the festival. Helping Hamlin serve these guests is a lineup of renowned chefs including Chef RJ Cooper, a James Beard award winning chef who has has recently moved to Charlotte, NC, where he has been tapped to create a new culinary experience for the Charlotte Marriott City Center. Local Chef Craig Deihl with his passion for preserving meat. He is a founding member of the Butcher’s Guild, a network of meat professionals that promotes responsible butchering through education and community, and to date, he has produced over 90 types of charcuterie which have been prepared, stored and cured in-house at Charleston’s Cypress. 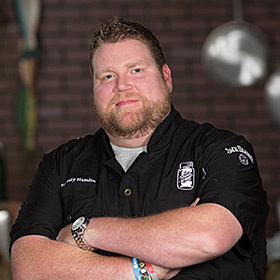 Chef Patrick Owen’s southern roots run deep in his cuisine and he is no stranger to the Charleston food scene, as he grew up working his way through various kitchens in Charleston. He currently owns Langdon’s Restaurant + Wine Bar in Mt. Pleasant, earning the only AAA Four Diamond award East of the Cooper every year since opening, and Opal Restaurant + Wine Bar. Local Chef Mike Perez will also be joining this culinary lineup bringing his pasta expertise, along with members of the the Southern Ground Family, resident baker Nicole Crane with her gluten-free and allergen friendly baking, Chef Joshua Butler who has lent his culinary expertise as Executive Chef of Zac Brown’s restaurant, the Southern Ground Social Club, as well as with Zac Brown Band’s Eat & Greets, and Chef Collins Woods with his southern flare. In addition to locally sourced talent to contribute to the Southern Ground experience, Chef Hamlin also prides himself on using regional ingredients, farm-to-tent (or Stage Box), if you will. 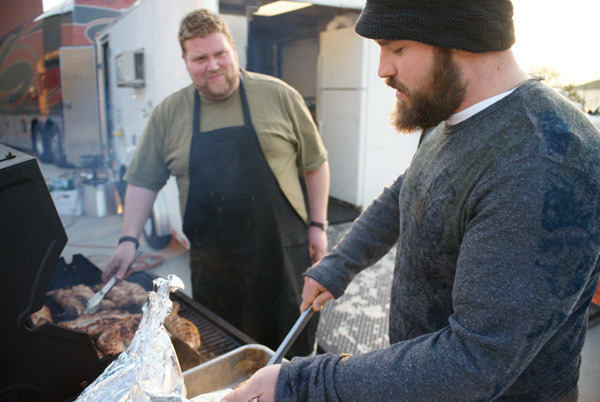 Pork is big menu item this weekend and Hamlin will be cooking over 550 pounds of regional Carolina pork. Most of the produce will either be from South Carolina or Georgia, along with some fresh Florida strawberries. “I would say that 90% of everything we are going to use, in hopes to feed somewhere between 5,000-6,000 people over the course of the weekend, is local,” stated Chef Hamlin. Chef Hamlin will be serving two of his own dishes to Stage Box guests. On Saturday, he will be connecting with his Louisiana roots as he serves risotto balls stuffed with crawfish, tasso ham, and cheese, served with a local okra creole tomato stew. On Sunday, Chef Hamlin will be pulling 275 portions of burrata cheese which will be plated with a roasted balsamic strawberry and arugula pesto with crispy baguette. “Oh my gosh, think about this. Think about a beautiful burrata ball, just for you, you cut it open in the middle and it’s like beautiful amazing salty, ricotta cheese coming out of the middle of it, oh my gosh it’s gonna be amazing,” Chef Hamlin shared. The Southern Ground Grub concession that will be open to the general public will also be headed by Chef Hamlin and will be turning out two dishes and a dessert by baker Nicole Crane. First is a family creole jambalaya recipe with chicken and andouille sausage. The second dish is a GochuJang Korean smoked pork shoulder, fermented Korean chili base marinated smoked pork shoulder with a green mango kimchi on top with a crispy wonton. And for a sweet ending, Crane’s gluten free, dairy free, and egg free oatmeal chocolate chip cookies. For the past five years, Southern Ground Music & Food festival has been bringing top talent, quality dinning, and lifetimes of memories to Charleston. 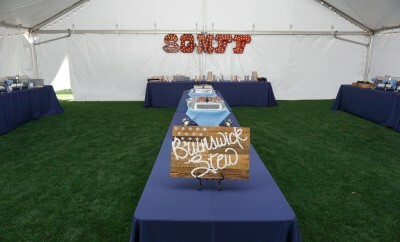 The attention to detail by Zac Brown and Chef Rusty Hamlin is unparalleled. For Chef Hamlin, the ability to share his art and interact with guests via Southern Ground experiences has been incredibly rewarding. It all started when a much younger Jackie dove into her parents’ record collection, grabbed that trippy Magical Mystery Tour album, and played “Strawberry Fields” over and over again until it was engrained into her soul. She grew up on the dreams and stories of Simon and Garfunkel, “Bleeker Street” being one of her favorites, the seduction of The Doors, Van Morrison, because “Brown Eyed Girl” is definitely her song, and the likes of Jefferson Airplane, The Who, Jimi Hendrix…you get the picture. It may not show on the outside, but Jackie has a hippie heart, and that reflects in her musical tastes today. While some of her favorites may or may not be jam bands, her taste in music feeds into many genres. From alternative, Brit, and indie rock - OK, maybe all rock - to pop, to rap, to electronic, she loves it all. As a northerner, she thought she would never understand country until she found herself on a Georgia farm in cowboy boots watching Luke Bryan shake it for her- yeah, she got that. She is a chronic wanderluster, she doesn't believe in guilty pleasures, enjoys a great Moscow Mule, and is an absolute music festival fanatic- you’ll find her wherever the music takes her.